The ezcap281 HD Game Capture is a box that records and streams your gameplay up to 1080P. Designed specifically for game lovers, this size capture device comes with on-board H.264 hardware encoder, which guarantees lower CPU usage and smaller file size even for full HD footages, not to mention the file format is extremely easy to work with for post-editing and uploading. The HDMI pass-through function guarantees smooth HD gaming experience even while recording. On top of that, it can be directly connected to streaming platforms; you can even add live commentary when streaming up. From now on, sharing your legendary matches is no longer a dream. 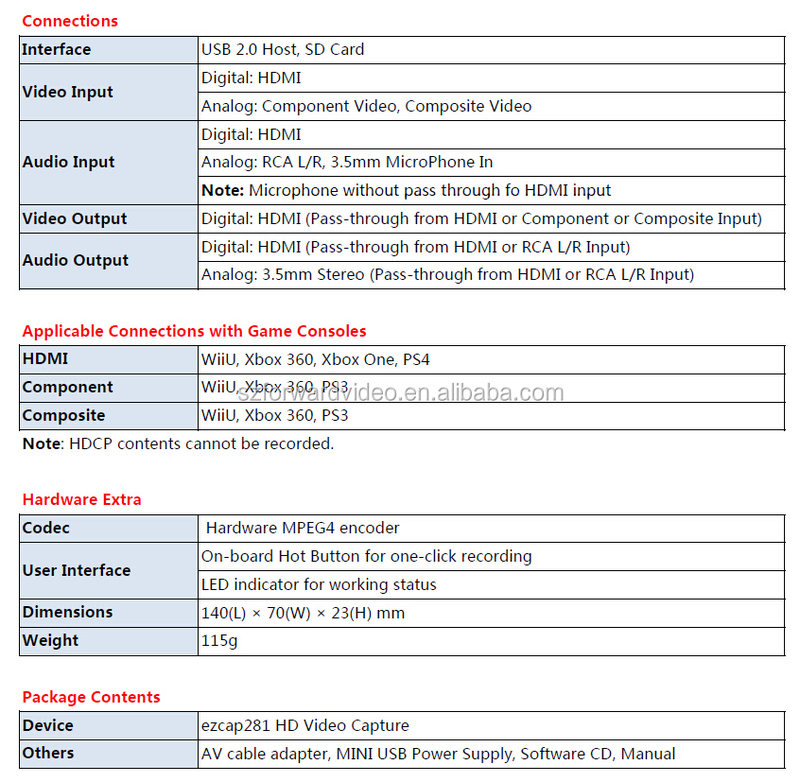 ezcap281 HD Game Capture provides the flexible connectivity with HDMI,Component and Composite inputs, which makes it applicable to all the mainstream gaming platforms, including Xbox 360 & One, PlayStation 3 & 4 Wii U. Even better, it's no PC enquired, Simply One click on the Record Button, 1080p recording is done right away. - 1080P recording with one click, no PC required. Easy to use, no any set-up. You just click RECORD button to record your gameplay. 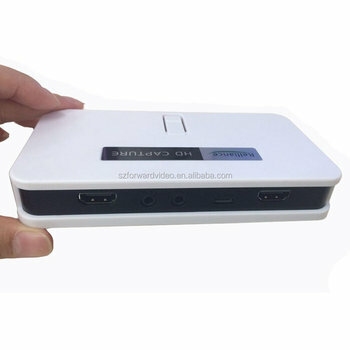 - More video input choice: HDMI, Component Video, Composite Video. With 1080P HDMI Passthrough, you can playing HD gameplay when you're recording it. Also with MIC in, can record voice with game together. - With 1080P HDMI pass through, you can play HD gameplay when you're recording it. - Portable design - 140(L) × 70(W) × 23(H) mm,bring it out of your room and share the gameplay and fun with your friends anywhere. - Both USB Flash Disk and SD Card - more memories choice! - With RTC(Real Time Clock) function, manage recording files easily. - Good Heat-dissipation design: the large areas of tiny holes ensure the stability of device for longterm operation and greater the raliability and longer service life. - Included video editing software, you can do editing and converting easily!